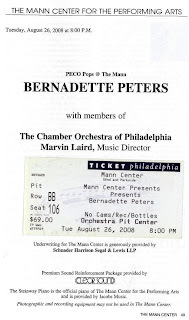 We literally sat down in our perfect seats - Row BB dead center - the minute before Marvin Laird began conducting Bernadette Peters' overture. We hit trafic due to a big wreck and then parking at the Mann Center was slow. But oh my goodness, what a great night it was. 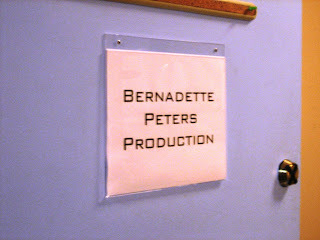 Bernadette was in rare form and performed those familiar songs better than I have seen her in a long time. The Mann Center is beautiful and it was an equally beautiful night. The audience loved every minute - even the woman in front of us, on the front row, who loudly announced the name of each song to her companions, thanks lady. Bernadette gave us a lovely combo of When You Wish Upon a Star and A Dream is a Wish Your Heart Makes that had just the loveliest arrangement of piano, muted jazz trumpet, drums and bass. I can't stop thinking of it. The other wonderful surprise was that she brought Johanna from Sweeney Todd back. Wow. She brought the house down with it. We heard a prelude of organ from the top of the Sweeney ovture first though and all the lights went red. It was surreal and I was uber excited. Noah said he thought for a minute that she would suddenly be Mrs. Lovett. Yes! It was almost all Sondheim and most of the songs were the same as usual, but not so as usual since she was on fire. She had more fun dancing around with You Can Drive a Person Crazy than I've ever seen her have. We had fun visiting her backstage. Sometimes I have to pinch myself and I know that the when it comes to Bernadette, she's the star I wish upon. Video by jeffreypbaker at Devos Hall in Grand Rapids, MI on April 15, 2008. PS, be careful when you try to take I-95/NJTurnpike back to NY because if you miss it, you're screwed. Really screwed. I am so jealous. Did she do Sooner or Later? She didn't sing Sooner or Later, but lots of Sondheim. Sorry I missed you Sarah, I would have told you a different way to go home. Actually, she sang "Later" from A Little Night Music. It was all divine. Wow! Glad to hear she's at the top of her game, still. I want all our divas performing forever. Hey I just noticed something hilarious about that first photo. 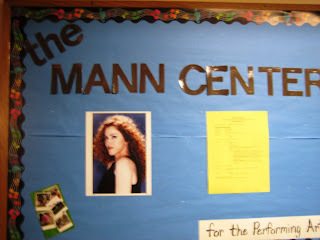 OK so the header "THE MANN CENTER" is neatly stapled onto the postboard, but then down at the bottom, hastly written on a paper cut-out is "for the performing arts"